తెలంగాణలో కామన్‌ ఎంట్రన్స్‌ టెస్టుల తేదీలు ఖరారు: తెలంగాణలో కామన్‌ ఎంట్రన్స్‌ టెస్టుల తేదీలు ఖరారయ్యాయి. 2019 విద్యా సంవత్సరంలో నిర్వహించే ప్రవేశ పరీక్షల షెడ్యూల్‌ను ఉన్నత విద్యామండలి చైర్మన్ పాపిరెడ్డి విడుదల చేశారు. పరీక్ష తేదీలను ఆయన ప్రకటించారు. Telangana CET 2019 exam dates are released, schedule for EAMCET, ECET, ICET and other exams has been announced. Telangana State Council of Higher Education has released the exam dates for various Telangana Common Entrance Tests. The candidates who wish to apply for the these State Common Entrance Tests are advised to check the exam schedules given below for their reference. As per the exam schedule released by the Telangana State Council of Higher Education, the TS EAMCET will be conducted on May 3, 4, 6 for Engineering and for Agriculture stream, the exams will be conducted on May 8 & 9, 2019. The TS EAMCET 2019 will be conducted by JNTU Hyderabad. Similar, the TS ECET 2019 exam will be held on May 11, 2019. This exam will also be conducted by JNTU Hyderabad. Kakatiya University will organise the TS ICET 2019 exams on May 23 & 24, 2019. For more details, visit the official website of the Telangana State Council of Higher Education. The Telangana State Engineering, Agriculture and Medical Common Entrance Test (EAMCET) 2019 will be conducted from May 3. 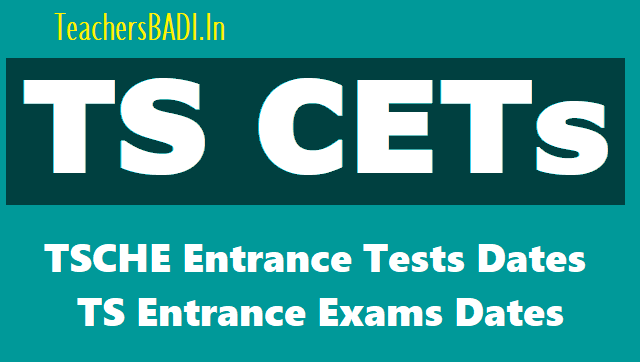 The schedule for all the Common Entrance Tests (CETs) has been announced by the Telangana State Council of Higher Education (TSCHE) on Saturday. This year, an entrance test for admissions into engineering courses will be held on May 3, 4 and 6, whereas for agriculture and medical courses, it is on May 8 and 9. Both the entrance examinations will be held in two sessions i.e. from 10 am to 1 pm and 3 pm to 6 pm. Like every year, the Council has entrusted the job of conducting the EAMCET to Jawaharlal Nehru Technological University-Hyderabad (JNTU-H). a. JNTU-H: The JNTU-H has been also entrusted with the State Engineering Common Entrance Test which will be held on May 11. It is conducted for polytechnic students and BSc mathematics degree holders for lateral entry into engineering courses. b. OU: The Osmania University will be conducting four CETs including LawCET and PG LawCET on May 20, Post Graduate Engineering Common Entrance Test from May 28 to 31 and Education Common Entrance Test on May 31.
c. KU: The Integrated Common Entrance Test (ICET) for admissions into MBA courses will be conducted by Kakatiya University on May 23 and 24 whereas the Physical Education Common Entrance Test (PECET) will be held by Mahatma Gandhi University, Nalgonda on May 15. Prof. T Papi Reddy, chairman, TSCHE, said except PECET, all the CETs will be conducted through Computer Based Test (CBT) mode. This year too services of Tata Consultancy Services (TCS) would be utilized in conducting the CBTs. “The Council has taken steps to complete the conduct of all CETs in May itself. Like last year, the Council and organizing universities will conduct awareness programmes and also hold mock tests for students so as to familiarize them with the CBT mode,” Reddy said. He also said the conveners for TS ICET, LawCET, PGLawCET, PGECET, EdCET would change and the Council would appoint conveners for all the CETs soon. TSCHE confirmed that students from Andhra Pradesh will have to write Telangana CETs to secure admission in the state. The T Government is ready to help the AP government in conducting the examinations. CETs dates and allotment of CETs to the Universities would be announced. Now, the TS government is going to the entrance exam for cets dates. So, this is good new for Students about these examination dates. Schedule of other common entrance tests announced. EAMCET date has been decided keeping in view other important exams in the country that are popular with Telugu students. The Jawaharlal Nehru Technological University (JNTU) will continue to conduct the Telangana EAMCET that will be held in May... while the other popular exam ICET conducted for admission into MBA and MCA courses will be held in May..... this year. ICET will be conducted by the Kakatiya University. TSCHE announces schedule for common entrance tests: The Telangana State Council of Higher Education on December 28 announced the schedule for Telangana State Common Entrance Tests (#TSCETs). All the exams will be held through online mode this year. Accordingly, the Engineering, Agriculture and Medical Common Entrance Test (EAMCET-2019) will be conducted by the Jawaharlal Nehru Technological University-Hyderabad from 3 to 9 May, 2019. According to the Telangana State Council of Higher Education (TSCHE), EAMCET date has been decided keeping in view other important exams in the country that are popular with Telugu students. Announcing the schedule of all the CETs in Janaury, The convenors of all the CETs would be announced. 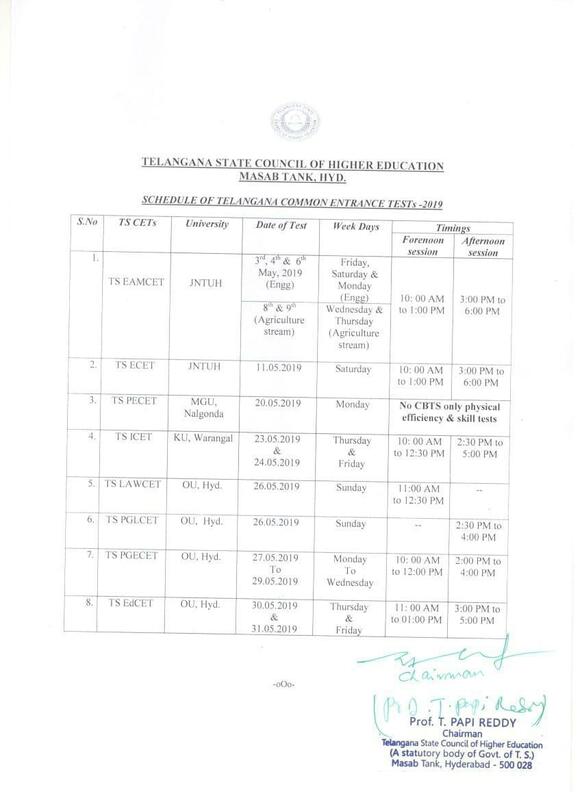 So, as per the given Telangana State Council for Higher Education (TSCHE) schedule as foolows. These various Common Entrance Tests for the students of Telangana. Mode of exam: All CETs, except TS-PECET will be conducted online. c. The Mahatma Gandhi University will hold PECET. f. PGECET convener - .. (OU). g. EdCET convener - .. The common entrance tests will be conducted between May 2 and 31. ECET, EAMCET ; PECET ; ICET ; LAWCET and PGLCET and PGECET would be held as per the above mentioed dates. The AP students seeking to join institutions in Telangana need to appear for these tests. Papi Reddy said that they were ready to hold Eamcet in AP if that State sought its help. The students want the exam to be conducted at the right time, as per schedule. Note: TSCHE Chairman has announced the TSCHE CETs 2019-TSCHE Entrance Tests 2019 Dates-CETs Dates 2019-TS EAMCET 2019-TS ICET 2019-TS ECET 2019-TS PGECET 2019-TS LAWCET 2019-TS PG LAWACET 2019-TS EdCET 2019-TS PECET 2019-TS OUPGCET 2019 Notifications Exam Dates and Schedules would be announced. The TS EAMCET-2019 will be conducted by the Jawaharlal Nehru Technological University-Hyderabad, Kukatpally from May 3 to 9. As per the tentative schedule of common entrance tests released by Telangana State Council of Higher Education (TSCHE), the JNTUH will also conduct TS ECET on May 11, 2019. While the ICET is to be conducted by Kakatiya University on May 23, 24, the TS PECET will be held by Mahatma Gandhi University from May 20 onwards. Osmania University will conduct LAWCET , PGLCET on May 26 and EdCET on May 30, 31 respectively while PGECET is to be held from May 27 to 29.